Propeller helps patients manage respiratory diseases like asthma and COPD. _ Digital therapeutics (DTx) deliver evidence-based therapeutic interventions to patients that are driven by high quality software programs to prevent, manage, or treat a medical disorder or disease. They are used independently or in concert with medications, devices, or other therapies to optimize patient care and health outcomes. Indications for use: Propeller’s digital platform is intended to help asthma and COPD patients and their physicians record and monitor medication usage, review symptoms, and receive other information about their disease management and its impact. When used under the care of a physician with a prescribed MDI, the system can be used to reduce the frequency of respiratory health symptoms and exacerbations by increasing adherence to MDI medications through the use of feedback such as reminders and notifications, and self-management education. Outcomes: Research has demonstrated that Propeller increases medication adherence by 58%, reduces rescue inhaler use by 79%, increases asthma control by 63%, and reduces asthma-related ED visits and hospitalizations by over 50%. What to expect: Patients use the Propeller platform by attaching a sensor to their existing inhaler. The sensor then tracks medication usage and location data and delivers insights to the patient via their smart phone, mobile phone, or desktop portal, including medication adherence reminders, air quality forecasts, symptom triggers, and disease management tips to help them self manage their disease. Directions: Patients use the Propeller platform by attaching a sensor to their existing inhaler. The sensor then tracks medication usage and location data and delivers insights to the patient via their smart phone, mobile phone, or desktop portal, including medication adherence reminders, air quality forecasts, symptom triggers, and disease management tips to help them self manage their disease. Risks & warnings: This sensor is not meant to communicate emergencies. Sensor information can be delayed, and your care team may not be aware of your condition. If your sensor interferes in any way with use of your inhaler, remove your sensor. Do not put the sensor underwater. Never delay using your inhaler in order to attach your sensor. Do not try to remove the battery from the sensor or service the sensor. The sensor is not a dose counter. Choking hazard; keep away from small children. Product description: Propeller consists of small sensors that attach to patients’ medication inhalers. The sensor is paired with a mobile app or desktop portal to automatically track medication use and provide personal feedback and insights that help individuals and their doctors manage and reduce symptoms. Propeller data can be accessed by healthcare professionals via a portal or via API. Prescription status: A prescription is not required. 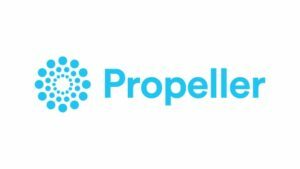 Patient access: Patients enroll in Propeller via the Propeller website or a similar enrollment process through their healthcare insurer, provider, or pharmaceutical company. 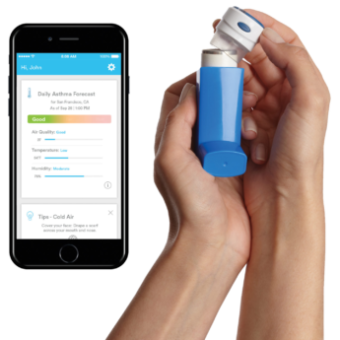 Once a patient has enrolled, they are directed to download the Propeller app and are mailed a sensor to attach to their inhaler. Provider access: Healthcare providers may access the Propeller provider portal to monitor patient health trends, medication adherence, and rescue medication usage. Coverage options: Propeller is made available through grants and partnerships with payers, providers, and PBMs. Over 40,000 patients have signed up for Propeller, more than any other digital therapeutic in the respiratory space. Effectiveness of Population Health Management Using the Propeller Health Asthma Platform: A Randomized Clinical Trial A total of 495 patients were enrolled in parallel arms (1:1) for 12 months of monitoring SABA use. Intervention group (IG) patients received access to and feedback from the Propeller Health system. Routine care (RC) patients were outfitted with sensors but did not receive feedback. Physicians were able to monitor the status of their patients in the IG and receive proactive notifications. Compared with routine care, the study arm monitoring SABA use with the Propeller Health system significantly decreased SABA use, increased SABA-free days and improved ACT scores (the latter among adults initially lacking asthma control). We compared asthma-related and non-asthma-related utilization event rates among patients during the intervention period to those during their pre-intervention baseline. We collected utilization data from EMRs between July 2012 and September 2015. Differences from baseline in rates per 100 patients per year were assessed using a Wilcoxon Signed Rank test. A digital health intervention significantly reduced asthma-related acute healthcare utilization, including ER visits and hospitalization. An increase in clinic visits suggests providers attempted to address patient worsening in a non-acute setting before an acute exacerbation occurred. Overuse of short-acting beta-agonist bronchodilators in COPD during periods of clinical stability Prospective 3-month cohort study of patients with moderate-to-severe COPD who were provided a portable electronic inhaler sensor to monitor daily SABA use. Increased use of SABA was common and associated with increased disease severity and symptoms, even though increased users were on more COPD-related inhalers and more had completed pulmonary rehabilitation. More research is needed to understand factors associated with increased inhaler use and how to improve correct inhaler use. Participants were enrolled in a single arm, pre-post digital health pilot study at the JenCare clinic in Louisville, Kentucky. Participants were eligible with a diagnosis of asthma or COPD and a compatible short-acting beta agonist (SABA) medication. A digital health intervention was feasible and effective among an older, diverse Medicare population. Participants demonstrated high activation and retention rates, significantly reduced SABA use and more symptom-free days. Feasibility of Deploying Inhaler Sensors to Identify the Impacts of Environmental Triggers and Built Environment Factors on Asthma Short‑Acting Bronchodilator Use We utilized zero-truncated negative binomial models to identify triggers associated with inhaler use, and implemented three sensitivity analyses to validate our findings. Utilizing a sensor to capture the signal of rescue inhaler use in space–time offered a passive and objective signal of asthma activity. This approach enabled detailed analyses to identify environmental triggers and built environment factors that are associated with asthma symptoms beyond the residential address. The application of these new technologies has the potential to improve our surveillance and understanding of asthma. Patient Reported Value and Usability of a Digital Health Intervention for Asthma Surveys administered to participants of a randomized controlled clinical study designed to measure the clinical effectiveness of the Propeller Health Asthma Platform. Respondents (n=89) reported being very satisfied (79%) or somewhat satisfied (20%) with the inhaler sensor, stating that the sensor was “small,” “unobtrusive,” and “easy to use” and carry. A total of 90% of respondents found the information they received via the platform useful, with 93% expressing satisfaction with the information. Remote Monitoring of Inhaled Bronchodilator Use and Weekly Feedback about Asthma Management: An OpenGroup, Short-Term Pilot Study of the Impact on Asthma Control Through an investigational electronic medication sensor attached to each participant’s inhaler, the study monitored 4 months’ use of inhaled, short-acting bronchodilators. Participants completed surveys, including the Asthma Control Test™, to assess asthma control at entry and monthly thereafter. Weekly email reports and access to online charts summarizing remote monitoring of inhaled bronchodilator frequency and location were associated with improved asthma control and a decline in day-to-day asthma symptoms. Randomized, controlled study of the impact of a mobile health tool on asthma SABA use, control and adherence This mobile health program, with sensor-enabled data collection and patient and provider access to the data, improved asthma outcomes, including asthma SABA use, control, and adherence in a real-world clinical setting. Adult patients with asthma and a SABA prescription were enrolled (n=125). Participants randomized to the intervention group (IG) (n=67) received electronic inhaler sensors to track their medication use, and access to smartphone and online applications that provided visualizations of their data, reminders to promote adherence, and personalized, guidelines-based education. Clinical care managers viewed IG patients’ data in an online dashboard to guide care. Participants in the control group (CG) (n=58) received sensors, but neither the patient nor the care manager received access to their data. Mixed effects regression models with random intercepts were used to compare outcomes between groups at 6 months.